Al Jazeera is one of the world’s leading media companies. On December 29, 2013, when three of its journalists were detained and jailed in Cairo while covering the upheaval in Egypt. 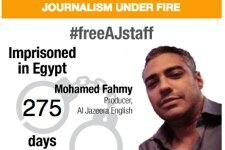 Looking for a way to galvanize support online and offline, Al Jazeera took its campaign to free its journalists to social media, focusing its efforts around the #FreeAJStaff hashtag. With its ability to spread messages and elicit real-time engagement, Twitter was central to this campaign campaign. Al Jazeera turned to Union Metrics to quantify the global support received, track coverage of key terms and deliver regularly updated reports. This case study explores how Al Jazeera used Twitter and TweetReach by Union Metrics to make this campaign successful.